Early June marks the start of the monsoon season in Mumbai. After two months of summer heat and humidity, it's a refreshing and welcome change. 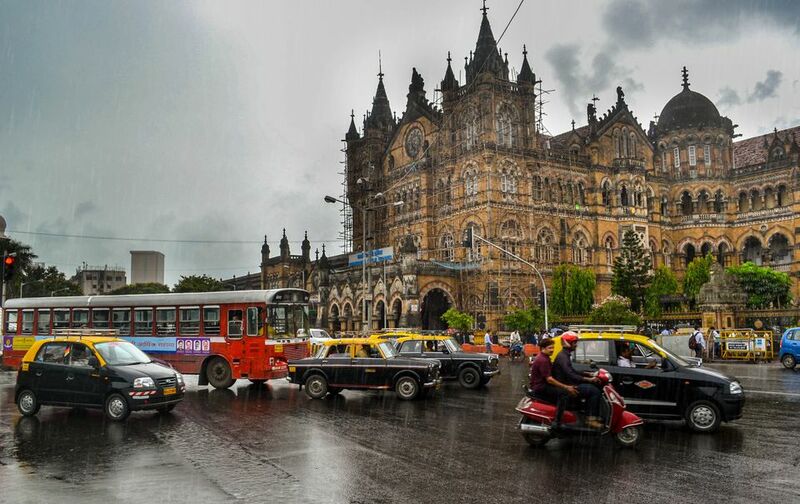 The monsoon in Mumbai usually arrives by June 15 each year. For a memorable time, experience it along the water's edge at these top six places. Wondering what the monsoon is like? Here's all you need to know about India's epic monsoon season. Affectionately referred to as The Queen's Necklace because of its row of sparkling lights, Marine Drive is the premier destination for experiencing the monsoon in south Mumbai. Join the crowd strolling along the promenade, or plonk yourself down and stare out into the Arabian Sea. If you're there during high tide be prepared to be sprayed from the waves that energetically rise up and onto the road. Feel like enjoying the monsoon with a cocktail? Head to rooftop bar Dome at the Intercontinental hotel. How to get there: Marine Drive links Nariman Point to Malabar Hill. If you're taking the Mumbai local train, get off at Marine Lines or Churchgate. The most iconic of the top attractions in Mumbai, the Gateway of India also gets some feisty waves during high tide. Dine on monsoon snacks from the street vendors. Otherwise, if you have cash to splash, the view across the bay from Souk at the Taj Palace hotel will mesmerize you. Alternatively, the newly renovated Bayview Cafe on the rooftop of the Hotel Harbour View is an ideal place to be! Cafe Marina, next door at the Sea Palace Hotel, is another great option. How to get there: Gateway of India is on the waterfront in the Colaba tourist district, opposite the Taj Palace hotel in south Mumbai. Haji Ali, both a mosque and a tomb built in 1431, sits right out in the ocean but is connected to land by a narrow pathway. The pathway becomes completely submerged during high tide, giving the impression that it's floating on the water. During low tide, it's possible to walk along the path to Haji Ali. With the waves lapping at your legs, it's an exhilarating experience. How to get there: Haji Ali is in central Mumbai, just off the coast of Worli. Take the Mumbai local train to Mahalaxmi railway station. If you can't make it to Marine Drive in far south Mumbai, Worli Seaface in central south Mumbai is the next best thing. It's also famous for its ferocious waves at high tide during the monsoon, and there's a promenade that you can walk or sit along too. How to get there: The best options on the Mumbai local train are Elphinston Road or Lower Parel on the Western Line, and Parel or Currey Road on the Central Line. Or, if you're coming from the suburbs, take a drive over the landmark Bandra-Worli Sealink. Cultura RM Exclusive/Philip Lee Harvey/Getty Images. Over in the plush Mumbai suburbs, visit the snack stalls at Juhu beach and sample some fresh pav bhaji prepared in front of you while you wait. Many of the top Juhu hotels offer discounted monsoon getaway packages. How to get there: The nearest railway stations are Santacruz, Andheri and Vile Parle. In the hip suburb of Bandra, the revamped Bandstand Promenade extends for around a kilometer from the rocky outcrop where the Taj Land's End hotel is situated. With the Arabian Sea on one side, and homes of the rich and famous on the other side, it's an evocative place for monsoon dreaming. While you're there, check out the "Walk of Stars", featuring the hand prints of famous Bollywood actors and actresses. How to get there: The Mumbai local train's Western Line has a stop in Bandra. From there, take an auto rickshaw via Hill Road.